Published by Credit Agricole Bank Polska S.A.
CA24 Mobile app allows Credit Agricole Bank Polska S.A. customers to manage current accounts, credit cards, saving products and loans on mobile devices. In the application you can; make a transfer, repay a credit card, Top Up mobile phones or open a deposit. 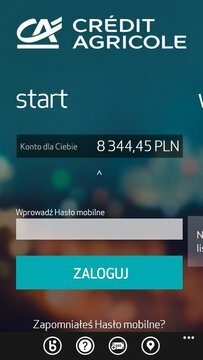 Before using the app you should sign the electronic banking agreement (Umowa Bankowości Elektronicznej CA24). Signing is possible through CA24 Internet service, CA24 telephone service and Credit Agricole branches. Activating the application is necessary before logging in. Use your ID and key set for CA24 Internet service. During activation you will set mobile password – for logging in, and mobile PIN for authorizing the transactions. Activation is confirmed with an SMS password.